Big congratulations and my thanks to this year’s Silver Buffalo Award honorees. At last week’s National Annual Meeting, 11 volunteers (nine are pictured above) earned Scouting’s highest honor for adults. In doing so, they joined a prestigious list that includes Walt Disney, James E. West, Norman Rockwell, and Jeff Gordon. Much of Mr. Brown’s work in Scouting over the past quarter-century has involved financial management and endowment development. He has never focused on money, but rather on the role money can play in building a strong organization that reaches more and more youth, including those with limited financial resources. Mr. Christen has served as a council president, executive board member, and capital campaign chairman, as a regional chairman and vice chairman, and as a member of the National Executive Board. He served as a Scoutmaster or assistant Scoutmaster for four national jamboree troops and on the staff of a fifth jamboree. But he says his most rewarding experience has been working with two local troops to help Scouts achieve the rank of Eagle Scout. In 48 years as an adult Scouter, Ms. Francis has served Scouting in four communities across three states. But her impact has been felt coast to coast as she used her deep experience to improve the Cub Scouting program for all boys. She was writer and editor on the Bear Cub Scout Handbook. Few embody Scouting’s core belief in duty to God more than Bishop Guglielmone. From his early days as a camp chaplain to his current service as a bishop of Charleston, he has worked tirelessly to show how Scouting and the church can work together to build young men of character. Scouting happens in the local unit, but it can’t happen without the local council. For more than three decades, Mr. King has worked to ensure the strength of councils throughout the Central Region. Elmer C. “Neil” Lupton, Ph.D.
A scientist by training, Dr. Lupton knows how to research a problem, learn from successes and failures, and share results with colleagues. That’s just what he’s done for Scouting in nearly a half-century of service. As a Wood Badge course director, a Philmont Training Center faculty member, an author of supplemental training modules, and a member of six national task forces, he has worked to ensure that best practices are shared broadly across the Scouting community. In 46 years as an adult Scouter, Vice Adm. Justin D. “Dan” McCarthy has served in nine councils across all four regions, on 10 national committees and task forces, and on the staffs of 12 national Order of the Arrow events, six national jamborees, and two world jamborees. And those numbers don’t do justice to the impact he has had on Scouting. A lifelong volunteer, Mr. McCarthy has recently been named Summit Group Director. Mr. Russell has always treasured his own experience as a Scout, and he has worked for more than 60 years to ensure that other Scouts have similar experiences. He served as a council president, council board member (for more than 30 years), Western Region vice president, and Western Region board member. Mr. Smart is an architect of Scouting’s future. 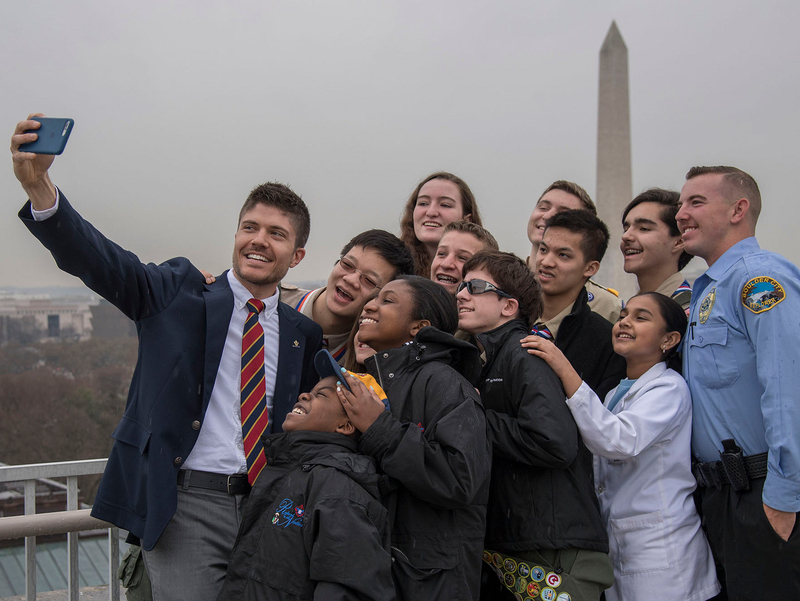 As national program chairman for the 2013 National Scout Jamboree, he has worked tirelessly since 2010 to reinvent Scouting’s signature event and support development of the new Summit Bechtel Family National Scout Reserve. That work draws heavily on his experience as a Scoutmaster or staff member at four national and five world jamborees since 1995. Just a year after taking the reins at AT&T, the world’s largest communications holding company, Mr. Stephenson took charge of one of the BSA’s most important projects in decades: the 100th Anniversary Celebration. From 2008 to the 2010 anniversary year, he chaired this comprehensive effort to celebrate the journey and continue the adventure of Scouting. That effort directly engaged more than 5,000 volunteers and staff members from every council in the country. A former Order of the Arrow lodge chief, Mr. Walker knows what Arrowmen are capable of, and he knows how to motivate them to do their very best. As the National OA Committee’s vice chairman for program, he pushed for the creation of ArrowCorps5, the BSA’s largest national service project since World War II, oversaw the highly successful OA Trail Crew Program at Philmont Scout Ranch, and initiated plans to create a similar program at the Northern Tier High Adventure Bases. Once again, let me say thank you to these fine Scouters for their service to our cherished movement.